The Philadelphia 76ers are all in on "The Process," and are reportedly looking to add a mega-star to an already exciting group. 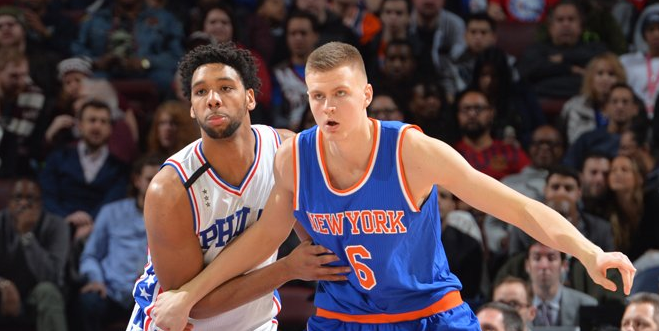 According to Adam Zagoria of zagsblog.com, the Sixers have inquired about acquiring Porzingis via trade. The Knicks have received calls from multiple teams regarding 7-foot-3 big man Kristaps Porzingis, a team source told ZAGSBLOG. The source said Philadelphia, Phoenix and San Antonio have called regarding Porzingis. The Daily News also reported that Boston contacted the Knicks. A Porzingis and Joel Embiid front court would be lethal, but what would the 76ers have to part ways with? Some have suggested Phil Jackson might require Ben Simmons to make a deal happen.